Holiday home suitable for 8 persons . 2 of the beds is only suitable for older children (4-11 years). The holiday home is 125 m² and is build in 1998. You can bring along 2 pets.The holiday home is equipped with 1 energy-saving heat pump. The holiday home has washing machine. Freezer with a capacity of 120 litres. Further more there is 1 wood-burning stove. The holiday home is situated on a 6104 m² natural site. The site is fenced in. Situated 3000 m from the sea. 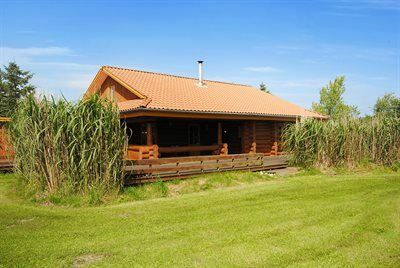 Situated 1500 m from inlet. Nearest shop is 4500 m away. A 100 m² terrace belong to the holiday home. Furthermore the house has a 20 m² covered terrace. You find a tool shed. Carport is at your disposal. Parking place by the holiday home.